Kowa Genesis 33 binoculars are the mid-sized versions of Kowa’s highest quality binoculars. Genesis 33 binoculars are made with Kowa’s Prominar XD glass lens elements which reduce chromatic aberration for a clearer, sharper view. Kowa Genesis 33 binoculars are compact, lightweight and very comfortable in the hands. What these little Genesis binoculars provide is the optical performance of a high-end, full-sized binocular at a smaller size and, very importantly, at a smaller price. We contend that Kowa Genesis 33 binoculars are a genuine case of less being more. The Genesis 33s are roof prism binoculars made in 8x and 10x magnifications. 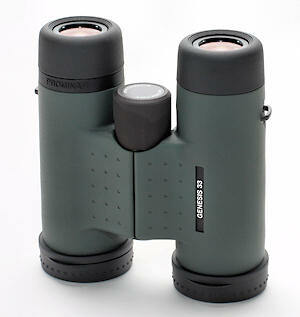 Four lens elements (2 per barrel) of Genesis binoculars are made with Kowa’s Prominar XD glass. The XD glass is high-density and low dispersion, which reduces the amount of chromatic aberration experienced by the user, yielding bright, razor-sharp images that visually pop. 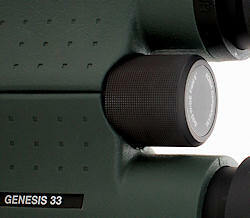 Like all quality roof prism binoculars today, the 8x33 Genesis are phase-coated. Additionally, all lenses and prisms are fully multi-coated for greater clarity and light-throughput. The prisms are made of an enhanced BaK-4 glass for greater internal reflection, and less light loss. Kowa added their dielectric C3 coating to the one critical prism face to increase reflection and thus, light throughput. These steps all maximize the amount of light getting through the binocular while minimizing distortion or splitting. That all translates to a brighter view, sharper image quality and more vibrant colors. We’re here to tell you it works very well indeed. The 8x33 Genesis is a very bright little binocular. Ultra high-density glass comes at a cost of weight, which can make for a heavy binocular. Such is emphatically not the case with the 8x33 Genesis, which are made with durable magnesium frames and weighed just 22.2 oz. on a postal scale with everything on: lens caps and rainguard. Genesis 33 binoculars have a nicely compact frame at 5.25 inches long (5.6 with eyecups fully extended) and 4.75 inches wide. This isn’t the smallest 33-mm binocular we’ve seen, but it’s a great compromise between being too small for those with large hands and too big for small ones. Kowa Genesis binoculars have an interpupillary distance range of 55-74 mm. This means that even though these are a small-frame optic, they will fit your face comfortably and without undue eye strain unless you have an unusually wide or narrow face. Genesis binoculars are coated in dark olive-green rubber armor with black accents on the eyecups, focus knob and lens caps. The inner barrels have broad, shallow divots where the thumbs fall for extra comfort. The strap attachment lugs are well placed to avoid discomfort from chafing on the webbing between thumb and forefinger. The focus knob on the Genesis 33s is a black, textured aluminum dial with smooth but slightly stiff action. This knob requires 1.6 turns to go from minimum close focus to infinity, which is a bit slow, though not ponderously so. On the plus side, a slow focus mechanism is more precise and more stable when sharing the binocular. Moreover, the focus mechanism will likely loosen with use. The 8x33 Genesis have a very impressive minimum close focus, easily focusing on objects just 5 feet away with minimal to no collapse of the visual field. That is superb performance in this regard. Another property in which the Kowa Genesis 33 binoculars excel is their field of view. The 8x33 Genesis has a 420-foot field of view at 1000 yards, which is well above average in this regard. The 10x33 model is no less impressive at 357 feet at 1000 yards, again above average for this class. The eyecups of the Genesis 33 binoculars adjust outward with a counter-clockwise twist, and go through two discreet, firm positions between fully-in and out. The intermediate positions are very stable and do not collapse even when bumped; this is well executed. Eye relief on the Genesis 33 binoculars is 15 mm for both the 8x and 10x models, which is a bit on the short side. This means that some people who wear glasses when using their binoculars need to check these for fit since this may not be enough eye relief for them. Kowa Genesis 33 binoculars have a fully-locking diopter mechanism. To adjust the diopter, pull the black plastic ring on the right ocular tube upwards to unlock it, and twist to either side. Pushing the ring back down re-locks it in place. While there isn’t a scale, there are markings on the ocular tube and the ring itself that can mark the position if memorized. Overall, this is a great diopter adjustment mechanism. On a quality optic, the rainguard and lens caps should be good, but frequently, poor design renders them more of a nuisance than a feature. Kowa Genesis 33 binoculars are kind of in-between on these. The rainguard is made of a two somewhat hard plastic cups linked by a flexible tether that closely fit over the rubber eyecups. There are brackets on both sides of the rainguard for threading the strap through, with the right side bracket being gapped to permit the strap to slip out for ease of use in the field. The objective lens caps are made of very flexible rubber and are tethered to rings that fit well over the barrels. They dangle nicely when opened and stay in place well when put there. The rings that the tethers are attached to fit firmly over the binocular barrels and don’t slide off easily. The lens caps are heavy enough that they don’t fly up to occlude the view and they never fell off in the field. These are great lens caps! Why they don’t make the rainguard of the same material as the lens caps we don’t know – it would be much better! The strap supplied with the Kowa Genesis binoculars is a comfortably padded, 2-inch wide neoprene/leather hybrid with cordura segments to attach to the lugs on the binocular. It is not overly elastic, so the optic won’t bounce a lot as you move. The case is padded, black cordura as well, and closes with a double-toothed clasp. It’s large enough to fit the binocular even with the eyecups in fully extended position. There are pockets on the sides of the case for pens, lens pens or lens cloths to be slipped into. There’s really only one knock on the case: it doesn’t have a strap of its own and it doesn’t have any kind of belt loop attachment. This means that if the user wants to bring the case into the field, they have to carry it by hand. Kowa also includes a lens cloth in the package. We made several references to the diminutive size of the Kowa Genesis 33s. One other critical way in which the Genesis 33s are smaller is the price. The 8x33 Genesis sells for $1,150.00, while the 10x33 model costs $1,275.00 . That may seem like a lot to pay for a binocular, but a survey of the market shows otherwise. Typically, high-quality, mid-sized ED or HD glass binoculars run well over $1000; some of them are over $2000. The Genesis 33 binoculars provide a view that is crisp and bright, with an excellent minimum close focus and a large field of view. They are wonderfully lightweight and comfortable in the hands, especially if you have small hands. In effect, you get high-end optical performance in a binocular priced more towards the middle of the market. In short, the Kowa Genesis 33 is a beautiful little binocular.